Don’t spend your weekend scrubbing and sweating, breathing in Pine-Sol and Ajax, when you could be enjoying the beautiful sun and sky outside. 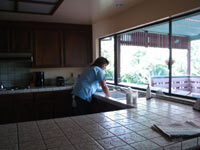 Let Eco-Care Professional Housecleaning take care of all your cleaning needs. From floor to ceiling, we cover it all. Just as no two homes are alike, no two customers are alike either. We happily customize our service to add or remove house cleaning tasks so that you can get the cleaning service that meets your exact needs.